Success Lessons from a High Wire Walker - Brilliant Breakthroughs, Inc.
Do you notice success lessons as they appear? How do you filter success lessons into your life? Ready to learn how supported you are? Success Lessons surround us at all times! Are you noticing them? One happened last night only 90 miles from my home and I was honored to witness this! Last night Nik Wallenda, a 7th generation high wire walker, created 2 Guinness Book World Records walking the high rope in Chicago. It was phenomenal to watch him! Undeniably, he is High-wire Royalty. Last night success lessons were about 500 feet high in the air! Nik was not fearless (which he later admitted), he was courageous. Yet he practiced his expertise over and over again. When it came time to perform effectively, he could. I watched a man last night do something unthinkable – especially in the Windy City! This was a unique opportunity. If you haven’t seen his walk yet, click here. Nik was inspiring. His grace was not just physical. 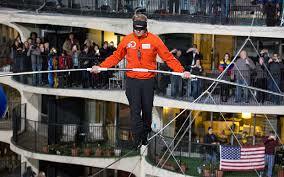 Indeed Nik Wallenda could share success lessons with us one right after another, but let me share what I learned witnessing his great feat last night. I watched and listen to Nik Wallenda. Nik kept moving in the face of adversity. He didn’t slow is momentum down at all. He was cautious and prepared. Consistently, he was in communication with each of his teams: his fans, his camera crew, and his coach. He embraced technology, which allowed us to hear him processing and soothing himself during his feats. He kept moving when the task became more difficult as he did the incline. He trusted his practice, his coach, and God (which he referenced often). His success lessons were endless! Did you notice this success lessons as you watched him? Just as Nik Wallenda had a great deal of support. So do YOU! OK, it might not always feel like it at times, but it’s true! First you have the opportunity to support yourself to do what other believe is un-doable or un-thinkable. Everyday people are doing the un-thinkable. It even happens on schoolyard playgrounds! Nik may have been the only person on the high-wire last night, but he had a whole team supporting him: His Father is his coach and guided his when he did his blindfolded walk. His family for personal strength. His camera crew and news team. His fans cheering him on. His strong faith. His knowing that this is what he is designed to do. His practice for assurance. We are supported like this all the time too! If you don’t feel that support, I encourage you to begin finding folks what believe in you and what you are doing! It makes all the difference in the world. Who knows, you might even pick up some extra success lessons and end up in The Guinness World Book of Records yourself! Thank you Nik Wallenda and family for sharing your awesomeness with us. Please feel free to comment or share how you embrace success lessons from what you encounter in daily life. Nik Wallenda, as he walked the high-wire in Chicago last night, taught us plenty of success lessons to implement for us to get to our destination. Thanks for your courage Nik! Looking forward to seeing his next walk: recreating his Grandfather’s walk with 2 headstands on the high-wire. Blessings of ongoing success to everyone! Good timing on this with all the high wire news from a ‘flying Walenda’ family member lately.